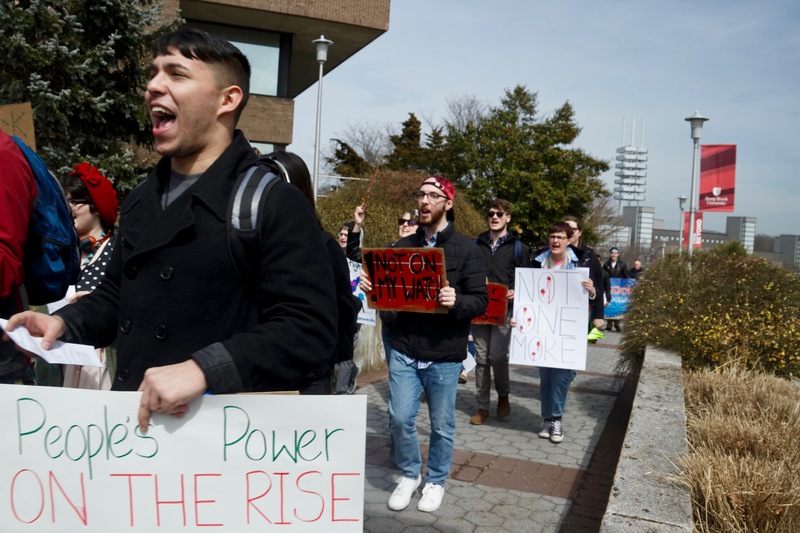 Stony Brook student activists and political leaders from various groups joined together to demand gun control reform in a march on campus on Wednesday, March 28. This march was the latest in the worldwide series of March for Our Lives protests that erupted around the globe following the Feb. 14 mass shooting at Marjory Stoneman Douglas High School in Parkland, Florida, where 17 people lost their lives. The Stony Brook Young Democratic Socialists of America (YDSA) chapter hosted the event along with the Stony Brook College Democrats, the Feminist Majority Leadership Alliance (FMLA) and Students for Justice in Palestine (SJP). Speakers from each organization gave speeches to the crowd in front of the Academic Fountain, outlining their views on gun violence in America and making their demands for reform. Following the speeches, students stepped in procession and chanted a series of slogans through campus, heading from the fountain to the Student Activities Center before turning right and looping back around up through the Staller Center for the Arts and the Charles B. Wang Center. At the onset of the event, YDSA co-chair and senior biochemistry major Vasilije Durić emphasized that Stony Brook’s march was also protesting police violence against African Americans, particularly the March 18 death of Stephon Clark. Clark was shot several times in his grandparents’ backyard in Sacramento after police mistook the iPhone in his hand for a gun. YDSA called for Stony Brook’s University Police Department to disarm, pointing out that far more people have been killed due to police-related gun violence than mass shootings in the United States this year. Sheroff’s demand for UPD disarmament was echoed by SJP founder Shehran Uddin, a senior political science major, who also claimed the March for Our Lives movement was gaining media attention because the Parkland Shooting’s victims were mostly white. The College Democrats broke with other organizations’ demands for a disarmed UPD, instead asking for mandatory active shooter training for both Stony Brook police and students. Peter Henninger, College Democrats underclassman representative and a sophomore political science major, also advocated for reforms to student counseling at the university’s Counseling and Psychological Services (CAPS). Henninger finished with a call for Stony Brook students to voice their political views through voting during the upcoming Congressional Midterm Elections in November. Graduate history student Caroline Propersi noted the March 20 Great Mills High School shooting, in which an armed student shot his ex-girlfriend and another student, as an example of the prevalence of sexually-motivated male violence against women. Propersi said the attack only caught media attention because it occurred on school grounds. Around 30 people attended Wednesday’s march. Organizers attributed the low turnout to the march’s rescheduling after last week’s snowstorm hit campus during its previously scheduled March 21 date. A separate march was also held on campus on Saturday, March 24, one of 800 companion marches to the March for Our Lives rally in Washington D.C. Nevertheless, Sheroff said he was happy with the student body’s response to the event after its conclusion. A previous version of this article incorrectly listed Peter Henninger as the president of Stony Brook College Democrats. Henninger is the organization’s underclassman representative.